At a table in the little café nestled within Ashcombe Farm and Greenhouse’s gift shop, Kerri Laudig reaches out her arms to expose dirt encrusted palms and fingers, her hands telling the tale of decades working in gardens and greenhouses. Even without seeing her soil-stained palms, there’s a sense that if you cracked her open, Laudig would bleed rosemary, tomato vine, and begonias. There’s also a sense that Ashcombe is more than just a place of employment for Laudig; it’s a home. Laudig swore she would never end up working at her mom’s greenhouse shop. She wanted to be a psychologist, a veterinarian, a teacher—“I did not want to do my mom’s job. ‘I’m not working at that Ashcombe’s place’,” Laudig said, recalling her attitude towards the greenhouse during her adolescent years. But life has a way of uprooting plans. When psychology school didn’t work out, Laudig’s mother was waiting with open arms. Ashcombe is planted on Grantham Road just off of Route 15. 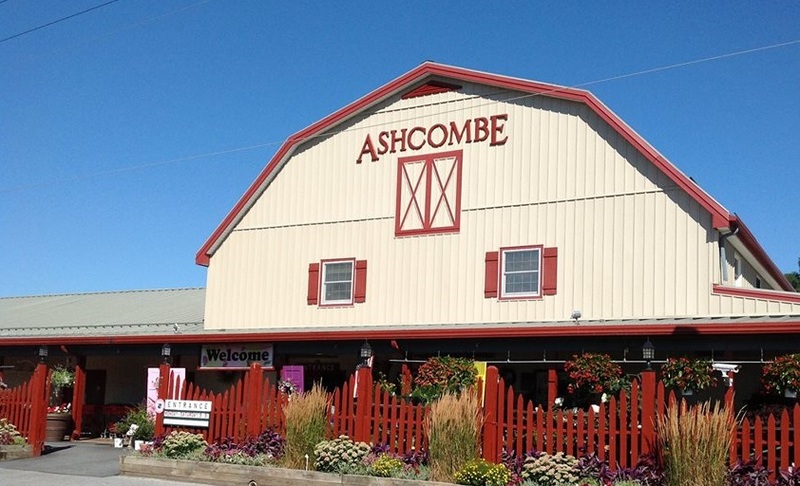 Once you’ve passed the giant rooster sign, the regal red barn that houses the greenhouse, and the bustling activity in the perennials section across the street make Ashcombe hard to miss. As the decorative gargoyles and lush, overflowing hanging planters usher you through the automatic barn-doors, you’re greeted first by a decadent gift shop. The café’s soups of the day are scrawled on a tiny chalkboard next to the displays of embroidered pillows, decorative birdhouses, and organic scented soaps. If you can make it past the endless, beckoning gifts, and the smell of fresh café delicacies, the entrance to the greenhouse is just around the corner of an imperceptibly whirring beehive, and down a short hallway of shelves lined with ceramic hedgehogs contorted in all sorts of funny positions—some smiling with their heads in their paws, others with their little legs splayed in the air, propped up on their spiny backs. Entering the greenhouse, especially in winter, is like venturing into a new world where everything is warm and colorful. Like stepping into the rainforest, except everything is for sale, there are no poison dart frogs, and you’re not in Papua, New Guinea, but rather in the village of Grantham, Pennsylvania. There’s something about Ashcombe that just makes it feel different than other greenhouses—the classes for kids and their parents, the gorgeously decorated gift shop, the goat and pig both snuffling in their pens out back, the rows and rows of intriguing flora—but even more so than all the goods and services offered is the sense of community at Ashcombe that is felt almost immediately by those who enter the doors. “It’s almost like you’re a regular even if you’ve only been there once,” said Genesta Cheek, an out-of-towner all the way from Greencastle, Pennsylvania, who comes back to Ashcombe now and then to replenish her soap supply with the organic goat-milk soap that Ashcombe offers in a vast variety of scents and colors. Cheek said she was pleasantly surprised the first time she visited Ashcombe, recalling that she thought it was going to be a quick trip, but ended up spending over an hour there, admiring not only the plants, but the home décor as well, and even getting lunch at the café. Most of the patrons who frequent Ashcombe don’t live an hour away like Cheek, but are instead locals from the surrounding Mechanicsburg area. The greenhouse is a hotspot for experienced planters and beginners alike, because of its vast variety of plants, food, and gifts. As an overseer of all things Ashcombe, Laudig attests that the company wants to reach as many different people as possible. Laudig said that as the seasoned gardeners that used to shop regularly at Ashcombe are passing away, or moving into nursing homes and assisted living programs where they don’t have access to personal gardens, the demographic of Ashcombe shoppers is shifting. “Those people who were really into the gardening—the baby boomers and the next generation—we’re losing a lot of those. So we are trying to appeal to the next generation,” said Laudig. Laudig went on to point out a few groups that Ashcombe has begun to appeal to as the veteran gardeners are no longer their biggest demographic. One group that Ashcombe is focusing on reaching are adults in their twenties, and college students. With Messiah College just a stone’s throw from Ashcombe, Laudig said she definitely sees the campus community seeking out the Ashcombe experience. “The other day someone said ‘there was a whole group of Messiah kids here, they bought a whole bunch of succulents actually!’” Laudig recalled, though she didn’t see them herself on this particular occasion. “I missed them! I go ‘where were they? where was I?’” Laudig laughs. One look inside the dorm room of Rachel Jones is evidence that she’s one of the many Messiah students who can’t get enough of Ashcombe Farm and Greenhouse. An Ikea-style build-it-yourself cart parked in the path of sunlight streaming through Jones’ dorm window is home to over a dozen plants—mostly succulents, all from Ashcombe. So far, the adorable assortment of plants that she shares with her roommate seem to be thriving in their kitschy planters—which range from sweet and simple terra cotta flowerpots to an aluminum Wrigley’s gum tin and a ceramic roadside diner about the size of a tissue box. “I’m not an expert at keeping plants alive” Jones said, which is why she has stuck mostly to succulents and cactuses, both of which are plant families that require minimal watering and attention, a great choice for gardening beginners and busy college students. Laudig believes there are plenty of things that college students and beginners can learn from the process of growing their own plants. One college student who has certainly learned some of the gardening lessons Laudig expressed is Mary Roberts, another Messiah student and avid plant lover. Roberts has a bit more plant care experience than other students like Jones, explaining that she likes to buy the plants that are struggling and nurse them back to health, or even propagate from cuttings to grow new ones. “Both processes are incredibly rewarding and I wouldn’t give it up,” said Roberts. After falling in love with Ashcombe and shopping their regularly, Roberts had the idea to take her connection to the greenhouse one step further. Roberts runs her own plant blog, pricklesandleaves.com, and offered to promote Ashcombe’s business on her website. Ashcombe agreed, and took the collaboration even further; Roberts now not only promotes the greenhouse’s products and services on her blog, but was also given the chance to publish posts for Ashcombe’s Instagram account every Friday for the month of May. Roberts believes she has learned a lot from Ashcombe, and benefited from the relationships she’s formed there, not only in regards to her blog and social media, but also in regards to the workers and customers she’s had the pleasure to interact with. Interactions like the one Roberts had about daisies are far from unusual occurrences at Ashcombe Farm and Greenhouse. A common theme you’ll no doubt run into when visiting Ashcombe is that everyone who works and shops there is incredibly friendly, and there’s a sense of community based on a shared love for plants and growing things. “People love to come in here and they don’t know each other and they start sharing ‘I love this tomato’,” Laudig said, giving an example of something Ashcombe shoppers often bond over. “Vegetables is where people really have a lot of opinions. No matter who you are, where you come from, you can always bond on which tomato did the best,” Laudig said, going on to describe the conversations about tomatoes she often hears around the greenhouse. Laudig has no doubt heard Ashcombe patrons bonding over daisies and tomatoes countless times in the decades she’s been co-owner of Ashcombe with her mother. Laudig’s mother had worked at Ashcombe for years before Laudig joined in on the family business. “I have a lot of roots here,” Laudig said, going on to share how her parents met at the greenhouse, and Laudig met her husband there too. Laudig’s son has even expressed interest in working at Ashcombe alongside his mother and grandmother. “We’ll see about that,” Laudig said with a laugh. Hearing Laudig tell stories about working with her mother through the years at Ashcombe gives an even deeper sense of community and comfort to the already beloved greenhouse. I’m reluctant to end the conversation, but I know Laudig has a gardening class to teach in just a few minutes, so I let her go. I get up from the café table and say goodbye to Laudig as she ventures back to the greenhouse—likely to grab a watering can and make the rounds, or plunge her hands right back into a bag of soil before setting up for her class. Before I leave, I can’t resist plucking up the jalapeño-cheddar-pretzel for sale near the checkout counters. It was made in Ashcombe’s bakery, along with shoofly pies, monster cookies, and miniature baguettes. As the sweet, grandmotherly clerk hands me my receipt with a smile and wishes me a good evening, I’m still pondering one of the many profound things Laudig told me about this business that runs through her veins just like summer rain running through the hoe lines in a garden. Laudig said before that a lot of people call Ashcombe their happy place. But after just one short afternoon spending time with her, it’s obvious that Ashcombe is Laudig’s happy place too, all because of the time spent there with her mom working together in the greenhouse.